And after Identical of fraternal twins post, let's go deeper to one of the most intriguing malformations in human beings: the conjoined twins. The conjoined twins, also known as Siamese twins, are identical twins joined In utero (in the womb). It happens in 1 of 200.000 newborns, mostly in women (75%) and their survival rate is between 5% and 25%. 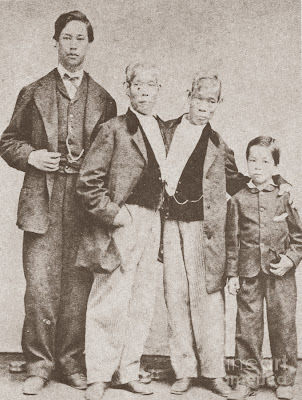 The name of Siamese twins comes from Chang and Eng Bunker, Thai brothers born in Siam (now Thailand). They travelled with P.T.Barnum circus, and they were joined by a band of flesh, cartilage and their fused livers at the torso. They were not only showed as "monsters", but also as good skilled acrobats and magicians, as well as good in business matters. Now we know what conjoined twins are, why does it happen? Conjoined twins develop when an early embryo partially separates to form two individuals. Although two fetuses will develop from this embryo, they will remain physically connected - most often at the chest, pelvis or buttocks. Conjoined twins may also share one or more internal organs. It is believed that when the embryo splits later than 12 days after pregnancy -in case of identical twins-, separation stops before the process is complete, and the resulted twins are conjoined. But there is an alternative theory that suggests that two separate embryos may somehow fuse together in early development. In any case, the absolute truth about the causes is not known yet. But what is a fact is that there have been several cases where conjoined twins have been separated with success, thanks to the advances in science and medicine. Watch this emotive short video of the success of conjoined twins separation at Medical City Children's Hospital in Dallas! Keep with us in Genetics and Beyond and discover more curiosities and facts in science!